2014 is the year of the trip…all the best music has an acid daze to it, Blossoms know this and their effortless, flowing, woozy guitar pop is perfect just like the 1988 windowpane Roses were. They call it ‘mosaic’ and you can see why- a crystalline wash of melody and ideas from a perfect pop band for the moment- they even look the part as well- all beatnik black and droog cool- like the Seeds or Love when they cared about perfect hair and posing in woodlands just like a classic psych band. Blossoms also know how to write a great tune and are poised at the edge of perfection. 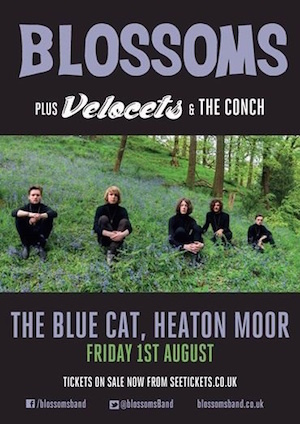 Blossoms – a mosaic five piece recently formed in Stockport, comprising of: Tom Ogden, Charlie Salt, Josh Dewhurst, Joe Donovan & Myles Kellock – have just confirmed a four date residency at Heaton Moor’s legendary Blue Cat Café venue. The south Manchester band, who recently completed recording their debut single (set for release in October & produced by The Coral’s James Skelly) at Liverpool’s Parr Street Studios, played a sold out show at Manchester’s Ruby Lounge on Friday (our review) before heading over to Sheffield for a rammed out, triumphant show at the city’s Tramlines Festival. Watch a Blossoms video below or over on Youtube if you’re using a smart phone.